With the canoe paddles planed down the time came to cut the shape of the blade. My buddy and I went to work tracing the shape from another paddle we had onto our paddle blanks. Once traced we headed to the bandsaw to cut the blades and handles shape. Next came the difficult part: Making a taper down the length of the blade while taping off toward the left and right edge to create an apex on each side of the blade. After researching many ways to perform the necessary cuts including using a hand plane, a power hand plane, a jointer, bandsaw (need a bandsaw that can cut large enough), CNC router, or a table saw I decided on using a router. The router with jig option delivers precision with a quality finish from the cut marks left behind. This should ensure repeatability in making multiple paddles and minimize the time spent sanding. My inspiration for using a router to create the necessary profiles was from Bob Bear’s website on making a canoe paddle from a single log. He demonstrates a router jig he made that he calls the Router Box Profiler. I built my own take on his jig that I like to call the Canoe Paddle Profiler. The Canoe Paddle Profiler is a pretty simple jig. The paddle’s blade is fixed to the floor of the jig. The router moves back and forth upon a carriage that forms an apex. The carriage itself rides along a sloping track. 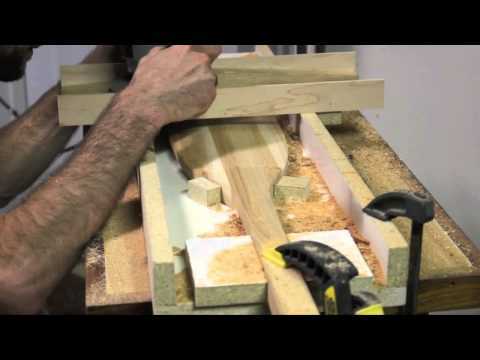 To operate the jig you simple chuck-up a fluted or spiral cutting bit and proceed to run the router up-and-down the length of the blade (upon the sloping track) while motioning the router back-and-forth (on the carriage). I will post more details on building a Canoe Paddle Profiler after my buddy and I route the second paddle. There are likely to still be a few adjustments to the final design. Next up we will round-over the edges of the paddles and start sanding the entire paddle to the final shape. From there we will move into finish sanding and to fiberglassing. In order to prepare our lightweight canoe paddles for shaping with the router and the bandsaw, we planed them down. While it is likely that we would have been able to use our router to plane the thickness of the paddle blanks down and even out the surfaces, it would have been quite difficult since both sites of the paddle were uneven. At the planer I took the thickness of the paddle blanks down to 1-15/16″. This gives us an extra 1/16″ of material to work with as we go down to our final maximum thickness of 1-1/4″ (paddle shaft).